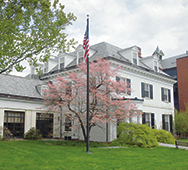 The Smith College Office of Alumnae Relations’ Online Services are owned and provided by the Smith College Office of Alumnae Relations (“OAR”) and are designed to facilitate communication among alumnae for personal or college-related purposes. The OAR will not sell or provide personally identifiable alumnae information to outside parties, except under special circumstances such as those set forth in this agreement, e.g. the OAR’s good faith belief that the law requires disclosure, and for the use of mailing program or service information sponsored by the OAR. All alumnae information is strictly guarded for use by individual alumnae and the OAR for personal and OAR-related purposes only. The OAR has taken all reasonable precautions to secure the personal information available through the Online Community. The Online Community is housed on a separate, secure server and is password protected to allow access by registered Smith College alumnae and authorized OAR and Smith College staff only. Although this precaution attempts to protect any personal information available through the Online Community from abuse or outside interference, a certain degree of privacy risk is faced any time information is shared over the Internet. Therefore, through one of the features of the Online Community, you have the ability to hide your information from being viewed by other Community members. Participation in the Online Community is a privilege. To safeguard the operation of the Online Community, the OAR has adopted guidelines and policies that are used by the OAR and Smith College to govern conduct, particularly conduct that occurs in an Online environment. Unauthorized copying, reproduction, republishing, uploading, downloading, posting, transmitting or duplicating any of the material is prohibited. You may download or copy any downloadable materials displayed on the Online Community for home, noncommercial and personal use only; provided, however, that you maintain all copyright, trademark and other notices contained in such material and you agree to abide by all additional copyright notices or restrictions contained in any material accessed through the Online Community. Use of information or communications available through the Online Community for any commercial, public or political purposes is strictly prohibited. Prohibited activities include, but are not limited to, solicitations for commercial services, cold-calling of any kind, mass-mailings for commercial purposes, or solicitations for religious or political purposes. Information available through the Online Community may be used for specific personal and OAR-related purposes only. Users shall not restrict nor inhibit any other user from enjoying any service on the Online Community. Posting of materials or use of language which in the OAR’s view is obscene, vulgar, abusive, defamatory, profane, threatening, harassing, hateful or otherwise offensive will constitute a violation of these policies governing the use of the Online Community. Additionally, users shall not upload, transmit, distribute or otherwise publish any materials containing a virus or any other harmful component. All aliases adopted by Online Community users are subject to approval by the OAR to ensure that the proper image is associated with the OAR. You also agree and understand that the OAR may preserve and disclose content/information if in the OAR’s sole discretion such is reasonably necessary to: (a) comply with law; (b) enforce the terms of this agreement; (c) respond to claims that a user has violated the rights of third parties, or (d) protect the interests, property, safety of the OAR, its users, or others. Use of the Online Community constitutes consent to such monitoring. Neither Smith College nor the OAR is responsible for screening communications in advance, and neither the college nor the OAR will actively monitor the use of the Smith College Online Community. For this reason, it is essential that the alumnae users of the Smith College Online Community report any abuses or misuse of the Smith College Online Community to the OAR. If the OAR determines that a user’s participation in the Smith College Online Community creates a liability for the OAR or Smith College, or that the user has violated the policies set forth herein, the OAR reserves the right, in its sole discretion, to take actions against the user. The OAR reserves the right to expel a user and deny a user further access to the Smith College Online Community if such user violates these policies or any applicable laws or regulations. You agree that the OAR, in its sole discretion, may terminate your password, account (or any part thereof) or use of the Online Community, and remove and discard any content within the Online Community, with or without notice, for any reason, including, without limitation, for lack of use or if the OAR believes, in its sole discretion, that you have violated or acted inconsistently with the terms of this agreement. The OAR may also in its sole discretion and at any time discontinue providing the Online Community, or any part thereof, with or without notice. You agree that any termination of your access to the Online Community may be effected without prior notice, and acknowledge and agree that the OAR may immediately deactivate or delete your account and all related information and files in your account and/or bar any further access to such files or the Online Community. Further, you agree that the OAR shall not be liable to you or any third party for any termination of your access to the Service. You may terminate the use of the services at any time by providing notification to the OAR at alumnae@smith.edu. The OAR reserves the right to terminate your access, without notification, for non-adherence of any of the rules set forth in this agreement. The reliability of the information available through the Online Community is largely dependent upon the actions of its registrants. The OAR can make no representations about the accuracy, reliability, completeness, or timeliness of this information. THE OAR DOES NOT WARRANT THAT THE ONLINE COMMUNITY WEB SITE WILL OPERATE ERROR-FREE OR THAT THE SITE AND ITS SERVER ARE FREE OF COMPUTER VIRUSES OR OTHER HARMFUL MATERIAL. THE ONLINE COMMUNITY IS PROVIDED ON AN “AS-IS” BASIS, AND TO THE FULLEST EXTENT PERMITTED BY THE LAW, THE OAR DISCLAIMS ALL WARRANTIES, INCLUDING THE WARRANTIES OF MERCHANTABILITY, NON-INFRINGEMENT, AND FITNESS FOR PARTICULAR PURPOSE. IN NO EVENT SHALL THE OAR, SMITH COLLEGE, OR THEIR RESPECTIVE TRUSTEES, FELLOWS, DIRECTORS, OFFICERS, EMPLOYEES OR AGENTS BE LIABLE FOR ANY DAMAGES WHATSOEVER, INCLUDING, WITHOUT LIMITATION, SPECIAL, INCIDENTAL, CONSEQUENTIAL, OR PUNITIVE DAMAGES, RESULTING FROM THE USE OF, DOWNLOADING OF OR INABILITY TO USE INFORMATION OR MATERIALS AVAILABLE ON THE ONLINE COMMUNITY WEB SITE. ADDITIONALLY, THERE IS NO WARRANTY THAT THE ONLINE COMMUNITY WILL MEET YOUR REQUIREMENTS; WILL BE UNINTERRUPTED, TIMELY, SECURE, ACCURATE, OR RELIABLE. THE USER HEREBY SPECIFICALLY ACKNOWLEDGES AND AGREES THAT NEITHER SMITH COLLEGE, THE OAR, AND THEIR RESPECTIVE TRUSTEES, FELLOWS, DIRECTORS, OFFICERS, EMPLOYEES AND AGENTS SHALL BE LIABLE FOR ANY DEFAMATORY, OFFENSIVE OR ILLEGAL CONDUCT OF ANY USER OF THIS ONLINE COMMUNITY. BY USING THE ONLINE COMMUNITY WEB SITE, YOU AGREE TO INDEMNIFY, DEFEND, AND HOLD HARMLESS THE OAR, SMITH COLLEGE, AND THEIR RESPECTIVE CURRENT AND FORMER TRUSTEES, FELLOWS, DIRECTORS, OFFICERS, EMPLOYEES AND AGENTS FROM AND AGAINST ANY AND ALL LOSSES, CLAIMS, DAMAGES, COSTS, AND EXPENSES THAT MAY ARISE FROM YOUR USE OF THE ONLINE COMMUNITY WEB SITE OR YOUR BREACH OF THESE POLICIES. The OAR will provide notice to you of any such action or claim, and reserves the right to participate, at our expense, in the investigation, settlement, and defense of any such action or claim. The OAR reserves the right to modify this agreement and its policies, with or without notice, and your continued use of the site constitutes your agreement to comply with such modifications. You should review this agreement periodically to ensure that you are familiar with the policies contained herein. This agreement constitutes the entire agreement between you and the OAR and shall govern your use of the Online Community, superseding any prior agreements between the OAR and you. You also may be subject to additional terms and conditions that may apply when you use third party services, third-party content or third-party software. This agreement shall be governed by the laws of the Commonwealth of Massachusetts and shall be subject to the exclusive jurisdiction of the Commonwealth and Federal Courts of Massachusetts. The failure of the OAR to exercise or enforce any right shall not constitute a waiver of such right or provision.